If anyone wondered what right-hand-drive donuts in a really light electric-vehicle looked like, we all may soon find out. Renault launched its third electric vehicle in the UK on Friday, the ‘baby’ of the family so far, the two-seater compact Twizy. GreenCarReports was invited to the island of Ibiza to test Renault’s latest electric effort. The Twizy isn’t your average electric vehicle, so this won’t be your average review. RENAULT has revealed it will be learning lessons from alliance-partner Nissan in how to market EVs to consumers. Speaking exclusively to Car Dealer, the head of Renault’s electric vehicle programme said that Nissan had ‘done a lot of trailblazing in tackling EV scepticism’ but added he will be thinking hard about how to market electric vehicles more effectively. For the first time ever, a fleet of mass-produced, zero-emission vehicles will take to the streets of Africa. Renault unveiled four electric concept cars at the 2009 Frankfurt Motor Show with a promise to make them widely available to motorists starting in 2012… Since then, Renault has publicised each milestone in this ambitious and unique project, securing the backing of governments, signing partnership agreements and testing battery safety. French car maker Renault has unveiled a low-cost electric car for British drivers. Trouble is, the £6,690 ($10,876) car doesn’t come with a few basic essentials. Like a battery. Or doors. The Hertz Corporation (NYSE: HTZ) has signed a Letter of Intent to add Renault’s new and innovative range of electric vehicles (EV) to the fleets of Hertz and car sharing club Connect by Hertz across Europe. Hertz will be one of the first rental operators to offer Renault’s Twizy for hire, and will also rent the ZOE, Fluence Z.E. and Kangoo Z.E. models. 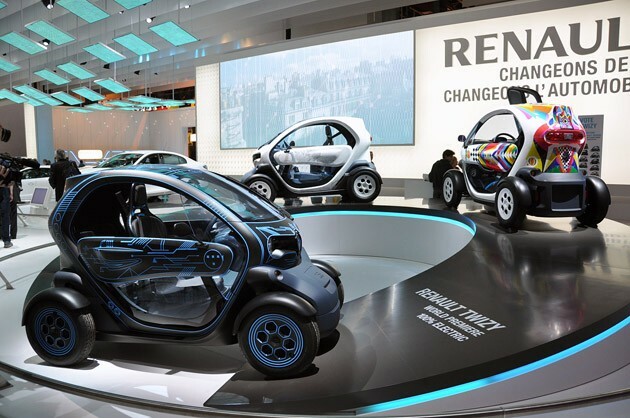 Europe: Renault Twizy Priced at Under $10,000, But EV Not Coming to U.S.
Renault has priced its Twizy two-seater battery-electric vehicle starting at 6,900 euros ($9,622 at current exchange rates) when it goes on sale in Europe this year, but like Renault’s other BEVs it will not be coming to the U.S.
PARIS (Dow Jones)–Hertz Corp.(HTZ) has signed a letter of intent to add Renault SA’s (RNO.FR) range of electric vehicles to the fleets of Hertz and car sharing club Connect by Hertz across Europe. -Hertz will be one of the first rental operators to offer Renault’s Twizy for hire, and will also rent the ZOE, Fluence Z.E. and Kangoo Z.E. models. PARIS (AFP) – French automaker Renault, staking its future on electric cars, has suspended three senior managers in what a source said Wednesday was a move linked to the suspected leaking of secrets on the new vehicles. In an address and Q&A session with Detroit Automotive Press Association, Nissan executive vice president Carlos Tavares promised three new plug-ins by 2014, shared some growth projections for the EV market, and offered a few interesting tidbits about early LEAF sales. Express ZE in 7 countries from the end of 2011. Renault-Nissan believes electric vehicles (EV) will account for 10% of the world automotive sales by 2020 and has invested €4 billion to help push its ambitions in the market. Renault and Nissan now have a global team of 2,000 people between the two companies which are dedicated to electric vehicles. familiar with the development said. Following on from the Memorandum of Understanding on electric vehicles signed at the Frankfurt International Motor Show on September 16, 2009, Europcar and Renault have taken the next step, with Europcar pre-ordering 500 Renault electric vehicles for delivery in Europe’s largest cities from the 3rd quarter of 2011. The Autonomous Government of Andalusia signs an agreement with the Renault-Nissan alliance to promote electric vehicles in the region. New Delhi: If vehicle manufacturers have introduced green cars at the Delhi Auto Expo, the city-state’s administration has decided to do its bit to reduce carbon footprint: provide electric charge stations. It’s hardly kept it a secret, but now Renault has officially announced that it will be putting its electric car range into production come 2011. You can read the full story on Renault’s electric vehicle range in CAR’s December 2009 issue out on 18 November, in which Chris Chilton drives the mad concept cars. MADRID, Nov 6 (Reuters) – French auto maker Renault (RENA.PA) said on Friday it would build its new electric car based on the Twizy Z.E. Concept at its Valladolid plant in northern Spain. Renault chose Valladolid for its know-how and competitiveness in making compact cars, and Spain for its proximity to the electric car’s target market of Western Europe.